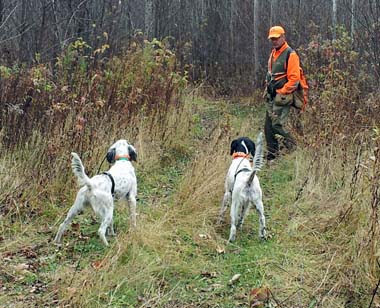 The 2011 grouse hunting and guiding season is over but not forgotten. For everyone at Bowen Lodge, it was a great fall. The majority of days were sunny and warm and the woods were very dry. The guides definitely needed to know the location of beaver ponds so the dogs could drink and cool off. There were fewer grouse than last year but plenty to make for good hunting. The dogs did a tremendous job of finding and pointing them--but some were more difficult because there were more old grouse than young. A high note was the good numbers of woodcock we found--more than most years. All-in-all, we had a wonderful fall with beautiful days, good friends and fine bird dogs. I picked up the phone in my office on the first ring because the Caller ID said it was from Sue, a Very Close Relative By Marriage. Since I'd left home only a half-hour earlier, and over coffee we'd talked about plans for after I got out of work, that could mean only one thing: Murphy. I'm not clairvoyant; I just know my dog. – almost always, actually, Murph is my dog. "No idea – but I'll bet you called to tell me." "I was getting ready to go shopping, she wanted to go and she was being a pest, so I shut her in our bedroom. She opened my purse, found a ten-dollar bill, and shredded it. I mean shredded." "It could have been worse." "It could have been my ten." "I'm immune – I don't have any fifties." See, the problem is Murph likes to get even. What? I can't go with you? That'll cost you ten bucks! For the two-hundred and seventh time, I congratulated myself on naming her right: If it can go wrong, Murphy will figure out how to make it happen. But she's not alone. They get even with us, you know, in case you haven’t been paying attention. They have their ways, the conniving little back-biters. Our first black Lab, Maggie, when she got old and retired from the hunting field, would watch me leave with Roxie the pup. You could almost hear her saying to herself, Well, fine! as she headed downstairs into my den, where she’d turn over my wastebasket, and shred everything – shredding seems to be a major part of the program. You think these dogs don't hold a grudge or get snippy when they don’t get their own way? You should have my job as a dog magazine editor - I hear it all, and some of it borders on the surreal. I got a call one day from a fellow that wanted to know if I’d ever heard of a dog (it was a German shorthair as I remember) letting a hamster out of its cage. The cage had one of those lift gate openings on the side. He'd go away, come home, and launch into an impromptu hamster-hunt. He couldn't figure out how the little rodent was doing it, so he set up a video camera, left the house, came back in an hour, and the hamster's out. The video held the evidence: The shorthair, his nose out of joint because he didn't get to go with the boss, used that very same nose to open the cage. Busted. He never paid any attention to the hamster, just let it go. We've all heard of dogs that figured out how to open refrigerators and steal a little tidbit to tide them over until supper, but I don't think you can call that getting even. I think it's smart. Visit us at www.pointingdogjournal.com, look over our visitors’ section as a sample of the sort of great information that's available there for subscribers only, then request a no-obligation issue, or call and request it at 1-800-447-7367. I'm heading to the game farm tomorrow so I thought I might learn how to clean the quail before I go. The Ducks Unlimited Story is the video compilation of DU's 75 years of conservation. Learn about DU from its birth to present day and the trials and tribulations of modern-day wetlands conservation.